A sense of ambition, astute management and wise recruitment are the recipe for success. For as long as I can remember there has been the charge of lack of ambition levelled at West Ham owners. Ambition, of course, may mean something very different to owners than it does to supporters. In fact, there may even be great diversity in what supporters want to see at the club; for every one who would welcome West Ham emulate Manchester City with foreign investment you may well find one who would see it as yet another nail in the coffin of tradition. Although many will have reached their own conclusions, it is difficult to know with any certainty what the ambitions of the current owners are or how they would measure success. A run of success would bring them both personal glory and an increase the value of their investment but what (or how much) are they willing to risk in its pursuit? They must surely be aware that bottom half finishes is not going to keep a 60,000 seater stadium full for too many seasons. 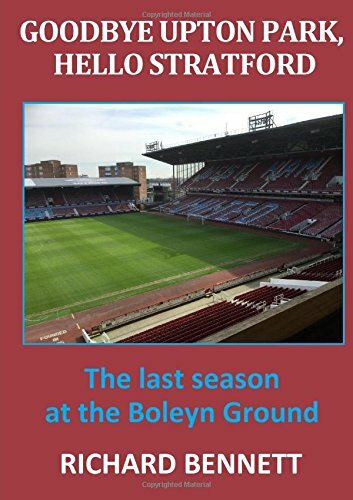 Season on season survival, in the style of Stoke or West Bromwich Albion, does not look a viable or sustainable option any longer now that the goalposts have moved and the bar has been raised. Vapid vision statements and talk of next levels is merely delusion unless the club actively plans for the future and addresses in a serious and timely manner ongoing issues such as player recruitment, youth development and below par training facilities. I saw an online poll in the week which suggested that ‘Bilic In’ held a narrow lead over ‘Bilic Out’. I have to say it surprises me that the manager continues to have such a high level of support. Possibly there is an element of ‘the Board might appoint someone worse’ and, of course, that would be a great unknown and past performance is not selling point. For me, it is not the poor results but the poor performances that are the problem. Focus on the results and there are always excuses to be found – we were never going to repeat the shocks of last year, we have been unlucky with injuries, the referee was against us, the new stadium is no longer intimidating etc. etc. Leaving this aside and looking at performances I see nothing to suggest a work in progress for the future that is just taking time to settle down. Almost everything on the playing side exudes an impression of chaos. Bilic supporters suggest that the problems can be resolved by spending more to bring in better players. If only it were as simple as spending your way to success then the manager’s job could well be redundant. The measure of a good or great manager is in making the best use of the resources available, and that only usually occurs where there is a set plan with players recruited and coached to execute it. Such a set up is sadly absent at West Ham at the moment. Another week and several more past their best players have been linked with a summer move to West Ham. The latest over 30 to be added to the list, that includes Defoe, Zabaleta and Kompany, is the lovable John Terry. It may well be pure speculation but this is the type of signing that the press expect us to make. At the opposite end of the spectrum completely the owners continue to make noises about unrealistic fantasy transfers that may as well include Messi and Ronaldo for all the likelihood there is of them being completed. A club like ours has to be spot-on with its scouting and recruitment. If a target is likely to attract the attention of a top 6 club then he is not going to sign for us (especially if he asks to take a look at our training facilities first); if we are competing for an established player with the likes of Stoke and Burnley then he is unlikely to be good enough. The challenge is to find those hungry, young players not yet appearing on the radar. Even if we only get a few years out of them before they go on to bigger things (or stay if we are bigger ourselves by then) at least it generates more funds to invest. Possibly an occasional older player can work out well (is Zlatan interested?) but it is a route we have followed many times in the past and I struggle to remember too many rip-roaring last payday successes – Stuart Pearson maybe!